Jimmie Johnson picked up the 2nd last-place finish of his Monster Energy NASCAR Cup Series career in Saturday’s Quaker State 400 at the Kentucky Speedway when his #48 Lowe’s Chevrolet was involved in a multi-car accident after 87 of 274 laps. 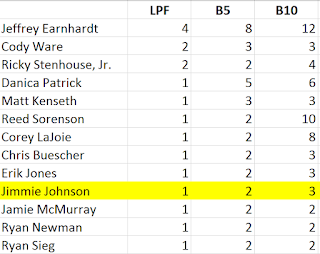 The finish, which came in Johnson’s 561st start, was his first of the season and his first in a Cup points race since last August at Watkins Glen, 32 races ago. Just over three months after The Glen ended his streak of 529 Cup Series starts without a last-place finish, the moment became a distant footnote to his record-setting seventh series title, captured with a hard-fought win in the Homestead finale. 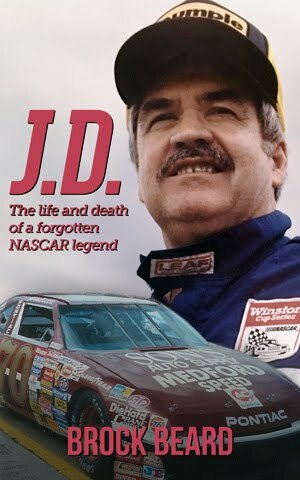 This year, Johnson shook off a slow start to the season with back-to-back victories at Texas and Bristol, then at Dover tied his hero Cale Yarborough with his 83rd career Cup victory, his 11th at “The Monster Mile.” Heading into Kentucky, Johnson was still in search of Win #84, and a chance to tie Darrell Waltrip and Bobby Allison for fourth on the all-time win list. 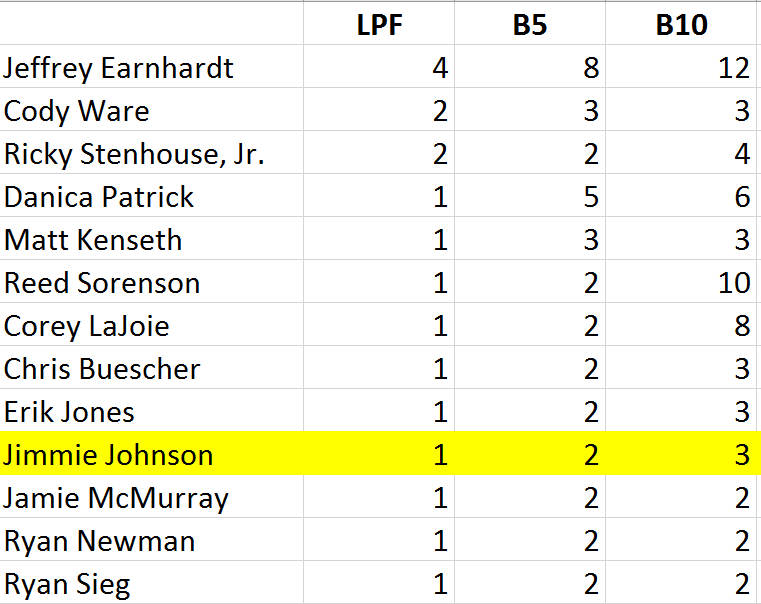 Ironically, Johnson had finished inside the Top 10 just once since the Dover win, a 10th at Michigan. He’d also run no better than 3rd at Kentucky, which came in the 2011 inaugural. In practice, Johnson turned the 12th-fastest lap in Friday’s first session, 6th in Happy Hour, and qualified 8th with a lap of 189.321mph. Starting last on Saturday night was point leader Kyle Larson, whose #42 Target Chevrolet was unable to pass pre-qualifying inspection in time to take a timed lap. He was joined at the rear of the field by Ryan Newman, whose Richard Childress Racing team swapped engines on his #31 Caterpillar Chevrolet. As the field cued up for the start, both were joined by B.J. McLeod and Jeffrey Earnhardt. McLeod, who hadn’t made a Cup start since 2015, was rumored to drive Rick Ware Racing’s #51 on Thursday. By Friday, he’d climbed aboard the Ware team’s orange Clemson University car from Pocono, though this time without any of the college’s logos. Earnhardt was back in Circle Sport with The Motorsport Group’s green #33 Chevrolet, which again carried sponsorship from Hulu. 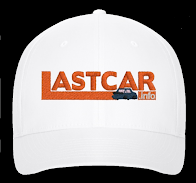 But as the field neared the start, still another driver was already making a bid for last. Gray Gaulding began the 2017 season with BK Racing, scoring a season-best finish of 20th at Talladega. Following a 29th-place finish at Pocono in June, his #23 was then driven by Ryan Sieg at Michigan, Alon Day at Sonoma, and teammate Corey LaJoie at Daytona. During this time, Gaulding tweeted that he had signed to drive Premium Motorsports’ #55 car at both Kentucky and New Hampshire. His Kentucky car would carry logos for #CheckIt4Andretti, the colon cancer initiative inspired by NASCAR veteran John Andretti. Gaulding started 39th of the 40 drivers in the field, but at the start was already making a trip down pit road. The crew looked under the car, then instructed Gaulding to make a slow lap to make it back to the entrance of the garage area. Incredibly, when Gaulding made it back to the garage area for a rear end change, NASCAR had not yet credited the #55 with completing a lap. 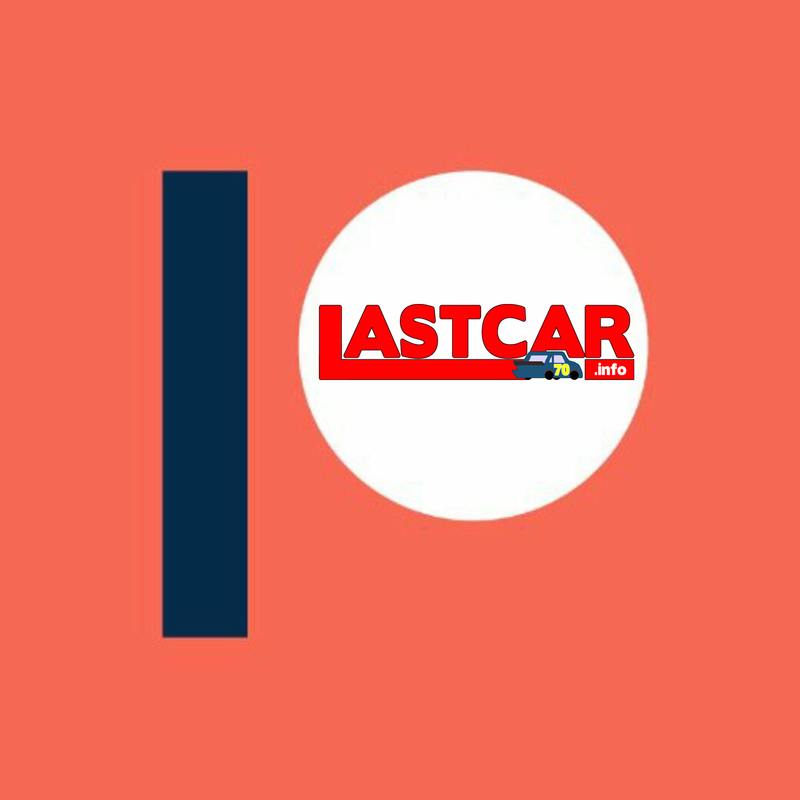 Following the first-lap exits of Norm Benning on Thursday and Brandon Jones earlier on Saturday, LASTCAR history was at hand. If the Premium Motorsports team was unable to complete repairs, it would mark the first time in NASCAR history that the last-place finishers of all three national series on a given weekend each failed to turn a lap in their race. However, from the first moments of trouble, Premium Motorsports announced that the repairs were soon to be complete, and they would be coming back onto the track. For better or worse, this has become one of the team’s traditions. A similar situation happened to Timmy Hill on two occasions back in 2015. At Indianapolis, his backup car broke an axle coming to the green. At Michigan, his Chevrolet sprung an oil leak that delayed the start. Both times, the crew managed to get the car back out there for several more laps. Another instance occurred with Derrike Cope earlier this year at Fontana, where the #55 pulled in for dragging bodywork which interfered with the car’s handling. Though apparently headed for Cope’s first last-place finish since 2006, the #55 rolled back out with 33 laps to go, finishing 38th. Around Lap 44, Premium Motorsports tweeted an update, showing the crew focusing on the left-rear of the car. On the 55th circuit, Gaulding fired the engine, and the team waited for crowds to part so they could make their way back out of the garage. This was done on Lap 57, when they finally crossed the stripe for the first time. While preventing NASCAR’s first-ever streak of last-place finishers who failed to complete a lap, it does mark the first time that both the XFINITY and Truck Series last-placers did so at the same track and on the same weekend. Gaulding settled into a rhythm as the first stage ended on Lap 81. When the race went green seven circuits later, the last-place battle took another unexpected turn. Heading into the third corner, a tight battle for sixth developed between Brad Keselowski’s #2 Miller Lite Ford and the #14 Rush Truck Centers Ford of Clint Bowyer. As the two worked the middle lane, Keselowski broke loose under Bowyer, sending both cars into a spin. 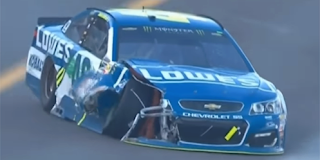 Stuck behind both cars, Johnson clipped the left-front of Keselowski’s car with his right-front, sending the #48 straight into the outside wall. Johnson managed to slow his car down, but couldn’t avoid heavy contact with the barrier, destroying the right-front suspension. Johnson pulled into the garage, done for the night. 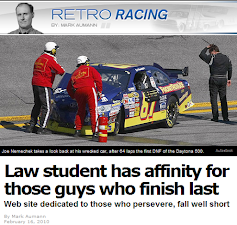 Johnson fell to 39th on Lap 107, then to last on the 146th circuit. Gray Gaulding managed to escape the Bottom Five, finishing 35th. Following the Johnson crash, Brad Keselowski made a pit stop, then a slow lap similar to Gaulding’s before also pulling behind the wall. He finished 39th on the night, two laps behind Johnson. It marks the third time this year that Keselowski has come within four laps of scoring his first-ever last-place finish in a Cup Series points race. As of this writing, he is 0-for-287, the second-longest active streak behind Kevin Harvick’s mark of 592. The next two retirees wrecked not long after the ensuing restart. On Lap 94, Kasey Kahne and Trevor Bayne lost control in Turn 2, sending both cars into the fence. Kahne ended up with the most damage to the right side of his white #5 Mountain Dew Chevrolet, and made a quick trip to the garage area. Bayne’s #6 Roush Performance / Lebanon Ford-sponsored Ford escaped with damage to the rear clip, and the team managed to get him back out there with tape and screws drilled into the battered rear decklid. With the already-small rear spoiler now out of alignment, however, the #6 proved too difficult to handle, and he exited the race not long after a spin on Lap 112. Rounding out the Bottom Five was Joey Gase, making his first Cup start since Talladega. Returning to the #23 Best Home Furnishings Toyota he raced in this year’s Daytona 500, Gase slammed the wall in Turn 1 on Lap 137, ending his night. *This marked the first Cup Series last-place finish for the #48 on a 1.5-mile oval.